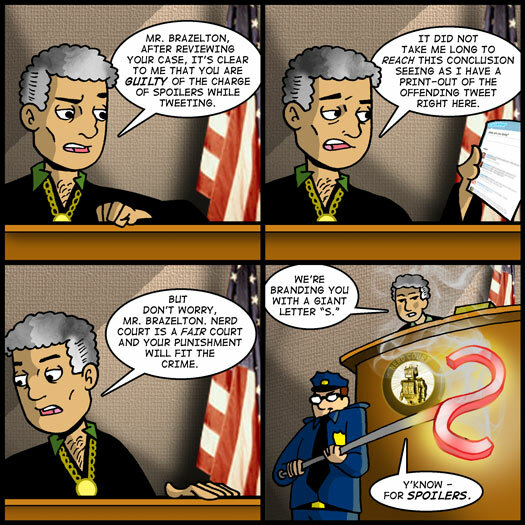 Mr. Brazelton, after reviewing your case, it's clear to me that you are GUILTY of the charge of Spoilers While Tweeting. I did not take me long to reach this conclusion seeing as I have a print-out of the offending tweet right here. But don't worry, Mr. Brazelton. Nerd Court is a fair court and your punishment will fit the crime. We're branding you with a giant letter "S."
How about going the Harry Potter route? Give him an S-shaped scar on his forehead and have him go off and transform himself into the boy wizard? …. or some twisted variation of Harry. That looks like a very large brand! You know, it would fit into the comic just fine, because that looks like that type of brand that would label one’s back or chest. So, it would always be hidden under Tom’s shirt until you ever wanted to pull it out for a reference. Hehe now that I think of it, if it’s on his chest it’s kinda like Superman, but opposite. Maybe with his new giant S scar he would take it upon himself to be some hero that is the preventer of spoilers.